Blue cheese is perfect for cold-weather entertaining. The cold weather is finally setting in and it’s time to break out the festive winter recipes. For me, this time of year signals a return to one of my favorite cheeses for pairing and entertaining: the infamous bleu. Blue cheese has always been polarizing due to its salty, pungent character, but its popularity has been on the up and up for quite a while. Last year, a Norwegian blue called Kraftkar was named World Champion out of the 3,000+ cheeses presented at the 29th Annual World Cheese Awards and international interest in blue cheese spiked. And rightly so: blue is more than just the stinky red-headed stepchild of the cheese world. There are so many varieties that you’re bound to find one you can enjoy. One of my personal favorites comes from the award-winning Rogue Creamery in Oregon. I ran into Rogue’s co-owner David Gremmels at a recent event in New York and he presented me with a chunk of their most sought-after Organic cheese: Rogue River Blue, a perfect choice for my first blue pairing of the season. The cheese itself is seasonal, made between the autumnal equinox and the winter solstice from pasture-fed cow’s milk, and exhibits a profound connection to the land. Each cheese is wrapped in a local Syrah leaf macerated in pear brandy, and has a rich, creamy texture and relatively light bluing. Its slightly peppery and deep herbal flavors linger pleasantly on the palate. But what to pair with this outstanding cheese? There are plenty of experts out there who’ve weighed in on what to pair with blues, but for me, the most important factor is choosing items that can stand up to the boldness of the cheese. In this case, I went with an extra-fruity red wine, also from Oregon: the Knudsen Vineyards 2015 Pinot Noir. While I wouldn’t often recommend a Pinot Noir with blue cheese, this particular wine is quite robust and boasts distinctive sweet cherry notes that complement the cheese perfectly. To finish up, I added two accompaniments: Cherries, Almonds & Linseeds Toast for Cheese from The Fine Cheese Co. (for their crunchy kick) and some luscious Caoba Venezuelan dark chocolates from El Rey. 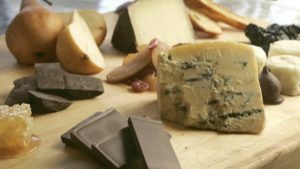 If you have yet to pair chocolate and cheese, you’re missing out; especially with intense blues, the sweetness of chocolate can impart a more nuanced flavor experience. Enjoying a good blue is one of wintertime’s great pleasures, so don’t be afraid to go for it, even if it means having to convince a few friends that they’ll enjoy the cheese. I promise they’ll thank you afterward. Read the full story at The Daily Meal.